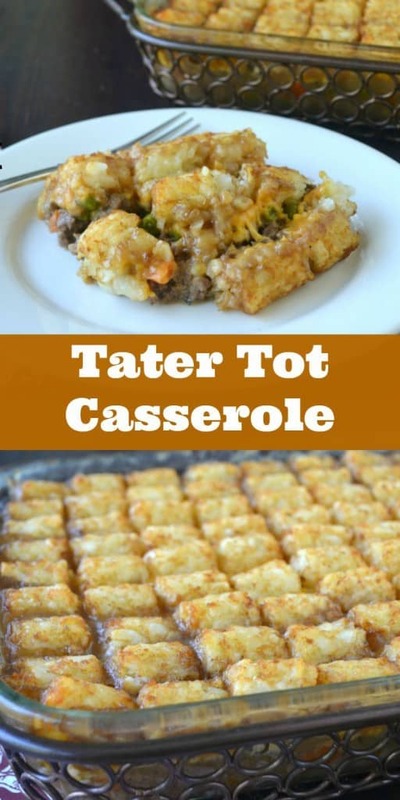 When I was a kid, Tater Tot Casserole was a definite dinner favorite of my brother and I. Beef and potatoes with lots of cheese, all in a creamy sauce. What more could you want? Heck we almost didn’t even notice the vegetables. It was a meal that was requested often. 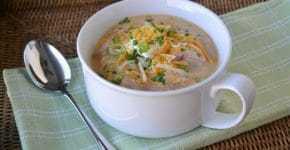 I took the classic version of this dish that is made with canned soups and updated it for our tastes. I won’t say I never use a canned soup, but I try to really limit them. It is almost as easy to make your own sauce as it is to open a couple of cans. There is a little more cooking time on the stove top, but trust me the flavor is worth it. 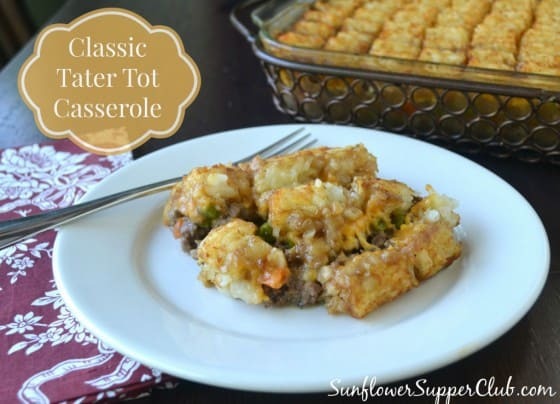 If you’re short on time this is a great casserole you can assemble earlier in the day and then bake when you are ready for dinner. It also freezes really well. Brown the ground beef in a large skillet over medium high heat until cooked through. Remove the browned beef with a slotted spoon and set aside. Reduce heat to medium and drain all but about 2 tablespoons fat from your pan. Add the butter and whisk until melted. Add the mushrooms, chopped onion and garlic. Sauté for about 10 minutes or until the onions are translucent and the mushrooms are soft. Return the browned beef to the pan. Sprinkle the flour over the beef mixture and stir to combine. Continue cooking for about 2 minutes. Slowly add in your beef broth and the milk. Add the thyme, Worcestershire sauce, hot sauce, salt and pepper. Bring to a simmer. Reduce heat to low and continue simmering for about 15-20 minutes until your mixture is thick, but you still want it saucy. Remove from the heat and stir in the sour cream if using. Stir in the thawed veggies. Pour the beef and veggie mixture In a greased 9 x 13 inch casserole dish. Evenly sprinkle the cheese over the top of the beef mixture. Bake for about 45 minutes until nice and bubbly and golden.